Please read our year end appeal. Our End Software Patents campaign has had an important victory on the road to ending software patents. We celebrated the 25th anniversary of the GNU project with a breakthrough film from actor/comedian Stephen Fry. We worked with SGI to free the software that makes your 3D desktop run. Our anti-DRM campaign DefectiveByDesign.org was at the forefront of the battle against the MPAA, RIAA, Microsoft, Apple, and others pushing restrictions. We released a version of the GNU Free Documentation License to help Wikipedia. After success in our campaign to free the Java trap, we have relaunched our high priority free software projects list to tackle the major obstacles that remain. We have initiated efforts to tackle the issues of freedom in network services. And more than 4,000 software projects are now using the additional protections offered by our updated free software licenses GPLv3, LGPLv3 and AGPLv3. You can find a complete listing in the back issues of our monthly Free Software Supporter newsletter. If you're not already subscribed, join the 12,700 people who are and keep up with our progress throughout the year. This work and much more like it will continue into 2009. So please help us now with your support. Become a member at http://fsf.org/associate/support_freedom/join_fsf or make a donation at http://www.fsf.org/associate/donate/. Put our fundraising widget on your website to show your support and spread the word. Ask friends to join, and get recognized for your work! Purchase a gift membership for a friend or family member. Subscribe your employer to the FSF newsletter ($240 annually), and encourage them to list job openings on the Free Software Jobs page. Ask your employer to become an FSF patron and get them to give back for the free software they use. 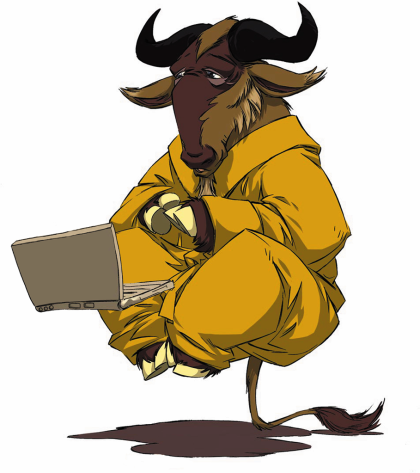 Buy one of our new GNU/free software t-shirts. Remember that if you join as a member you get 20% off! Please spread the word by forwarding this message, and thanks for your continued support!